My quest is very simple, love everything in life and find as many positive people as possible! I, as one, I am strong, but at 2000 and counting, not just me but WE can be stronger! 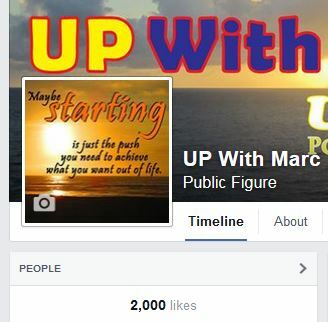 I am over 2000 here but on Facebook I just hit 2000 and I am very excited about this and look forward to more to come. I look back at all I have done in this time and it really feels like 6 years because I have done so much in my life and with myself! There will be many years to come and I am grateful for all those that will help me get there! Posted on April 11, 2015, in Personal Stories and tagged Facebook, Goals, gratitude, likes, love, positivism, upwithmarc. Bookmark the permalink. Leave a comment.